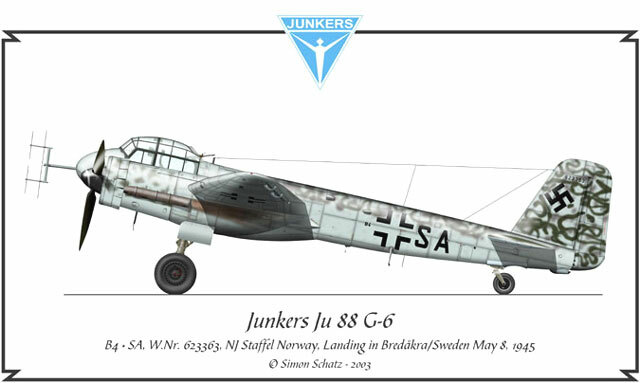 This Junkers Ju 88 G-6, B4+SA, W.Nr. 623363 was assigned to NJ Staffel Norway and made a forced landing on May 8 1945 in Sweden. Crewmen were Hptm. Werner Hüschens and Ofw. Sebastian Falk. As you can see I have added the factory emblem. Normally I add the Geschwader Emblem, but it was not possible to find one for NJST Norway. Maybe someone can help with a picture or drawing? Comments, criticism and statements are welcome.